Building up a blog or website is really a difficult task and picking a name that matches what you, your niche and your articles is a hell of a job. Many persons often thinking that using keywords in blog name is a perfect SEO strategy, Yep that’s true but what happens on a later run?. Or do you intend to change your blog name regularly? Definitely No, it will kill your SEO, Identity, and traffic. Blogging builds up with time and having a specific brand name that can fit into any topic is the perfect deal. Don’t be worried about getting ranked with keywords. As long as your have SEO optimized your blog content you will get organic traffic from search engines. Many times bloggers misuse brand name. 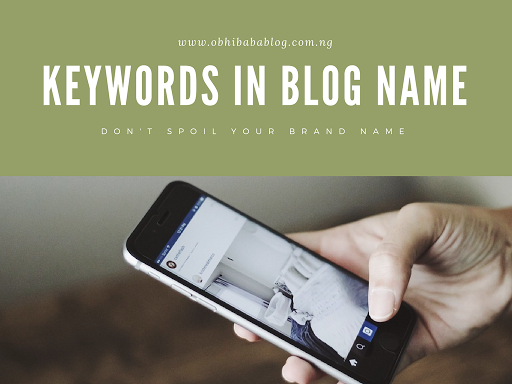 Over the week I planned on changing my blog name from ObhiabaBlog to something more memorable, easy to type in and SEO friendly then I decided to check popular blogs and their names so I could learn from them. Mashable: A technology, entertainment and news blog that started as just a technology blog. The word “Mashable” doesn’t limit this web site to any specific niche or type of posts. With time they moved from just a technology blog, down to an entertainment site and guess they might even run more deals such as Mashable Affiliate Program etc. TechCrunch: Big technology blog but the world “Tech” limits them to only technology articles luckily for theme “Technology” is a very wide topic that covers nearly everything on the internet. TheLondoner: A lifestyle blog that covers travels, restaurants, food, fashion etc. The name doesn’t really look cool for a travel blog? neither does it look cool for a food blog? but rather it sounds amazing for any type of blog. She can today decide to start talking about technology. ShoutMeLoud: Harsh Agrawal would have had issues creating older blog names from ShoutMeLoud if he had used a keyword like a blog, SEO, themes, tips etc. Today he has created other blogs under the name of ShoutMeLoud (ShoutMeTech, etc). TooXclusive: Primarily a music site but today, TooXclusive can decide to start adding other features like Interviews, videos, news, gossip, football news, etc. It can even work great for a tech blog. Using keywords in blog name is one of the brand naming tips I have learned while trying to change the name of my blog. Never limit your brand name to just a blog. You can do better and become greater. Keywords are cool but learn when and when not to use them in your brand name. Content is King in all circumstances. If you have good and quality blog posts, your blog will rank high in search results especially when you use keywords at strategic places. Never rate your internet brand with your blog, you could do better and expand to higher blogging heights. Previous How To Efficiently Blog As A Student.